The condo that never sells? “The Song That Never Ends” played, but did not end, on episodes of Lamb Chop’s Play-Along, a children’s TV show that aired on PBS from 1992-1997. It became quickly annoying. Each week. Every week. The lyrics and tune repeated. And repeated. And repeated. No progress. No resolution. The Shire in Louisville appears to have some commonalities with the song. Despite efforts of real estate agents; despite thoughts, well wishes and prayers of friends; despite offers and possibilities; it remains mine. Another sale has fallen through. My ownership just goes on and on. On Friday, I journey to Louisville. A couple of days later, Tricia will join me. And, we will stay at the Shire. The dismantled Shire. The Shire bereft of almost all comforts. The Shire that never sells. Care to buy a condo in Louisville? 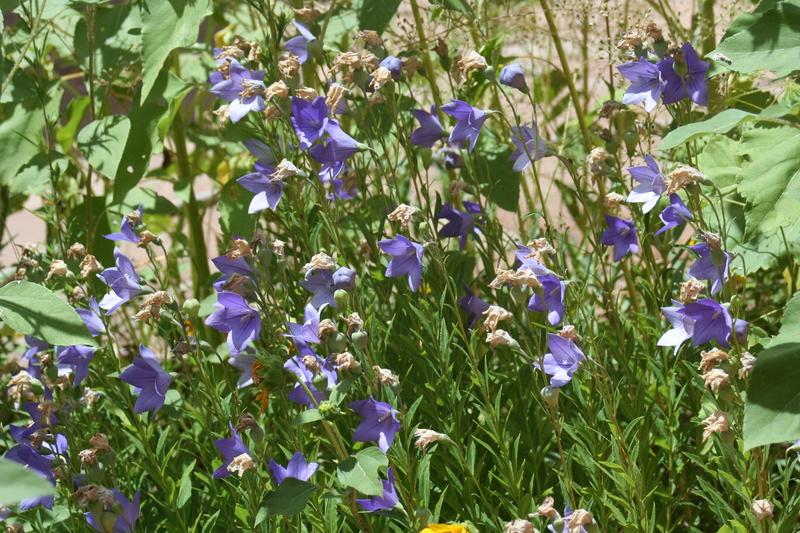 Working in chronological order and recognizing that photos of purple flowers have not been taken intentionally, this one comes again from Ghost Ranch – a reminder of the purple diversity that exists even within the same area. the Gunner and the Possum silent and buried. as the game plays on. HBP. Hit by pitch. It gets the batter to first base. In the The Bad News Bears (Walter Matthau version) on at least one occasion, Buttermaker asks Rudi Stein to allow himself to be hit by a pitch. It makes me cringe to remember it. Having runners on base leads to runs. A walk or being hit by a pitch can be as good as a hit. Crowding the plate may affect the pitcher in some situations. But the thought of intentionally letting a ball hit oneself … This could help explain why I played softball rather than baseball. Of course my speed that could only be tracked by a sundial may have played a role as well. When the bases are loaded, it also brings in a run. My return to baseball continued tonight when I purchased the MLB.com Game Day Audio package and listened to tonight’s Pirates game. I started late and actually only heard the Pirates’ half of the final inning. A hit and two walks loaded the bases for Matt Hague with two outs. The fifth pitch from Rafael Dolis hit Hague and allowed Jose Tabata to score: a walk-off HBP. And when the bases are loaded and the score is tied and it is the bottom of the ninth, that run wins the game. I confess. I am a Sean Bean fan. I don’t take it to the level where I can name how often or all the ways that his characters have died. But I do appreciate his craft and presence. My fondness for The Lord of the Rings trilogy leads to a fondness for Sean Bean and all those who appeared in the films – however long that appearance may have been – or short in Bean’s case, given Boromir’s death in The Fellowship of the Ring. Although I suppose, given the length of the film, Bean had a fairly long appearance at that. I watched advertisements appear around New York for Game of Thrones. They piqued my interest – but I don’t get HBO. My interest increased when I learned that the cast included Sean Bean. There is that great picture of him sitting on the Iron Throne. But I don’t get HBO. Then a couple of weeks ago, while wandering through a Half-Price Books, I noticed a DVD set of the first series. I picked up a copy of the first book and added the DVDs to my Netflix list. I decided to finish the book before watching the DVDs. After completing the book, I moved the DVDs to the top of the list. Tonight the first DVD in the series arrived. So far, so good. Great fun – with Sean Bean playing the honorable Eddard Stark (whose family words I have borrowed for the title). The return of the prodigal fan? I watched the last two innings of tonight’s Pirates-Mets game. A couple years back, my friend Wayne Gnatuk and I journeyed from Louisville to attend two games in PNC Park. Other than that trip, I have not watched the Pirates for some time – not an easy confession for one spent seven years on Neville Island in the Ohio River and most of my life in Western Pennsylvania. It was not always that way. I faithfully followed the Pirates for years. As a child – when I would have to go to bed before the games ended – my father would write the final score on a piece of paper and leave it by my place at the breakfast table. Beyond those three high moments, the Pirates were usually competitive and generally exciting in the years between and beyond. In 1992, they lost to Atlanta in the seventh game of the League Championship Series when Sid Bream, a former Pirate and one of the slower runners in the game, scored from second base on a hit to left with two outs in the ninth inning. Since that game, the Pirates have not had a winning season. Year after year, they have lost more than they have won. 19 years – the longest continuous streak of non-winning seasons in any of the four major professional sports in the U.S. At some point that I don’t remember, I gave up. I am not proud of that, but I did. Tonight I noticed that the Pirates and Mets were playing in Pittsburgh. I found the game on one of the New York cable stations and caught the end. Has the prodigal returned? I am not sure, but they play again tomorrow. I plan to watch again. Please note that this is not a case of jumping on a winner’s bandwagon. After tonight’s game, the Pirates’ record stands at 20-22.